All vehicles are one of each. All Pre-Owned or Certified vehicles are Used. A dealer documentary service fee of $589 will be added to the sale price or capitalized cost.. All offers expire on close of business the day subject content is removed from website, and all financing is subject to credit approval. Prices exclude tax, title, and license. Any agreement is subject to execution of contract documents. Every reasonable effort is made to ensure the accuracy of this data. Please verify any information in question with a dealership sales representative. 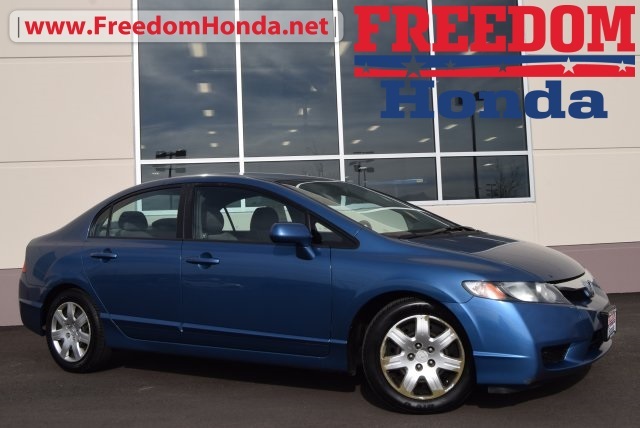 Atomic Blue Metallic 2011 Honda Civic LX FWD Compact 5-Speed Automatic 1.8L I4 SOHC 16V i-VTEC Gray Cloth. Freedom Honda - Find Your Drive : Home of Honda Care, NEW Honda, CERTIFIED Honda, used Honda for sale. USAA Dealer.